The weather has given us a slow march to spring, so we have had to create a little of the spring magic on our own this year. 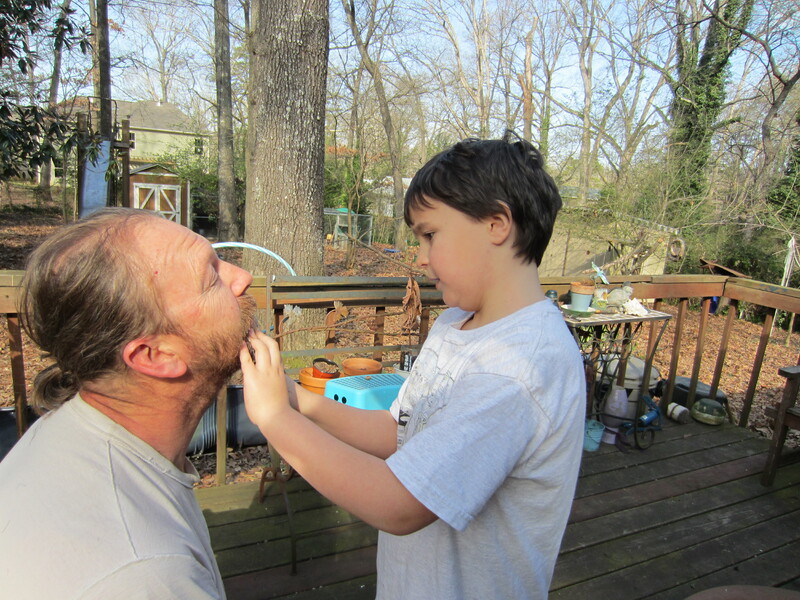 We begin with the shedding of the beard. Ivie gets to help cut the first layer. 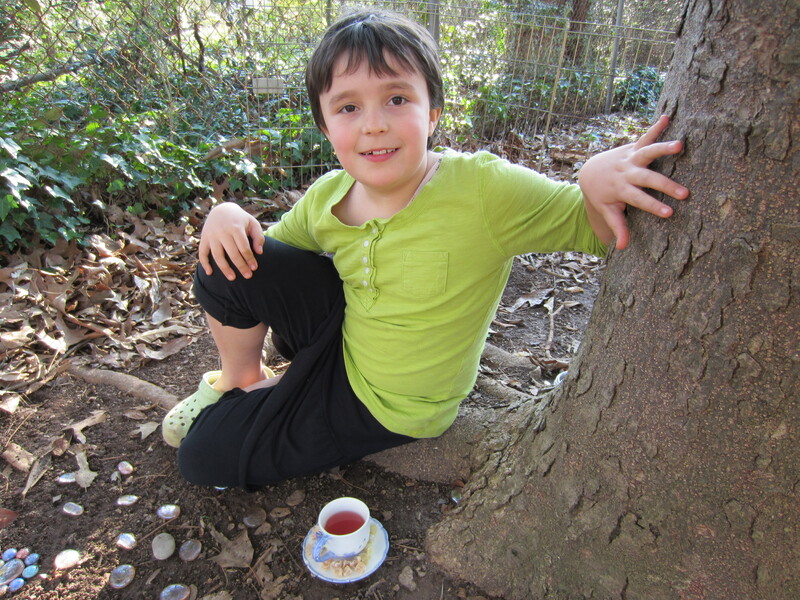 After working on her outdoor fairy garden, Ivie left out some treats (dried fruit and pink lemonade) for the fairies to enjoy on the Spring Equinox. 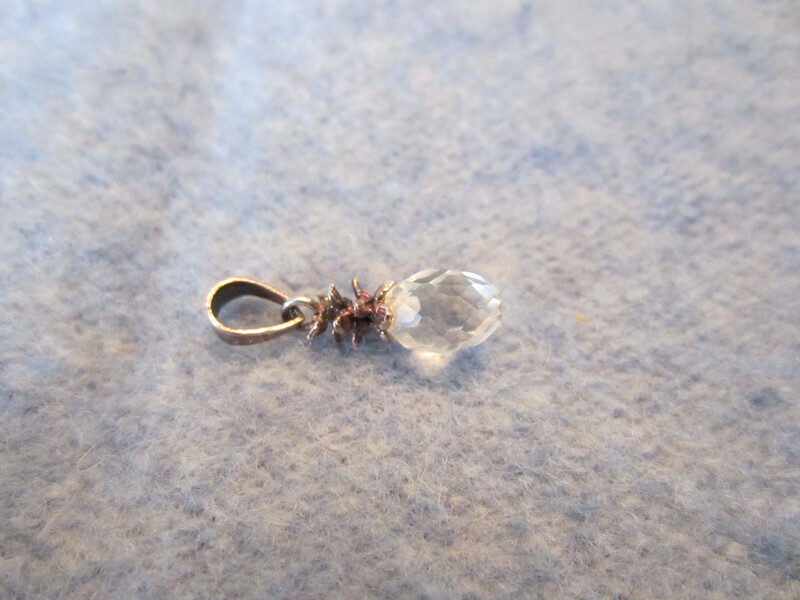 They showed their gratitude by leaving a sweet pendant in her shoe for her to find the next morning. The easter bunny’s helpers worked so very hard making bunnies for baskets this year. 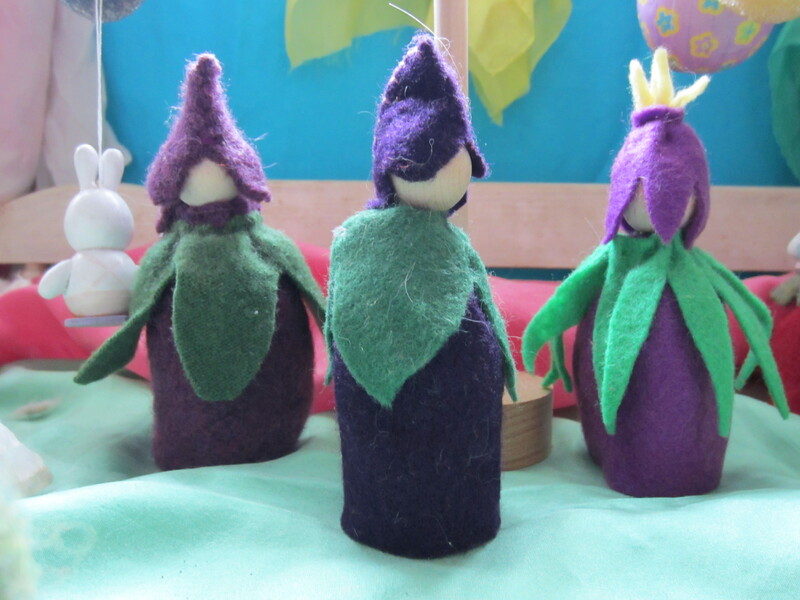 The hand puppets are based on the tutorial by Purlbee. The sachets are from Craft Passion. 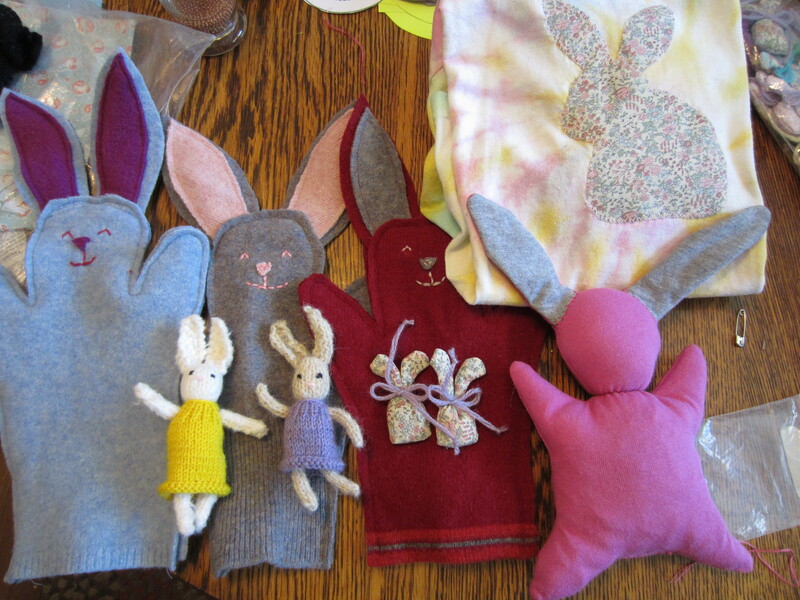 The knit bunnies are from Little Cotton Rabbits. 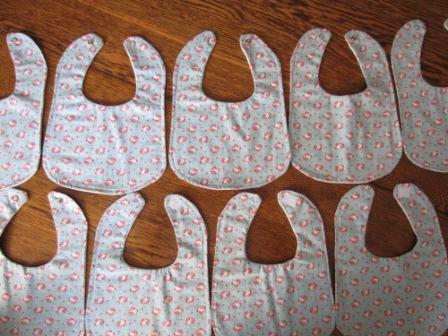 The plush bunny is based on the pattern from Chez Beeper Bebe. The applique on the t-shirt is just the simplest bunny silhouette that I could find on google images. 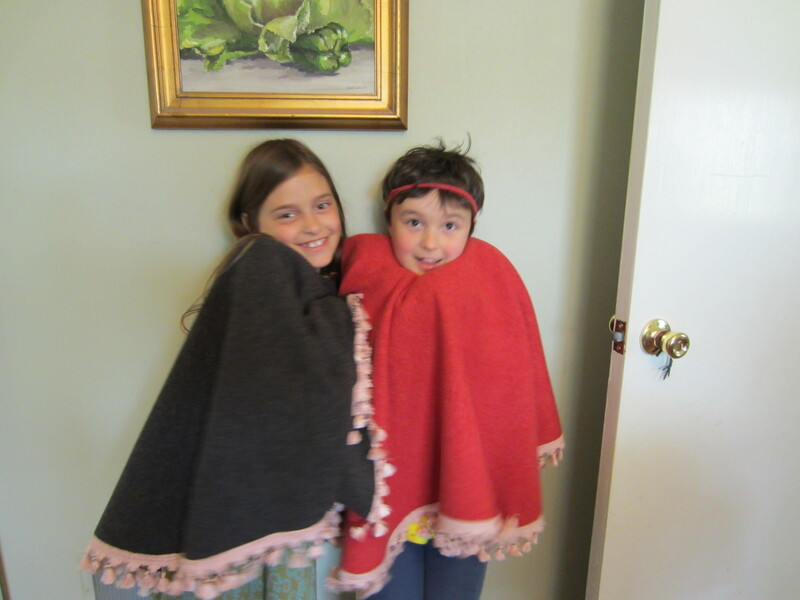 We were even prepared for the cold snap in late March with new fleece ponchos. What fun at Fabric World! Inspired by the lovely eggs I saw at Blue Girl, I made some egg pouches for Grade 3. While they do look cute on their own, all piled together gives them what I call the ‘Enchantment Shop effect’. If you make 25 of most anything, it looks good! 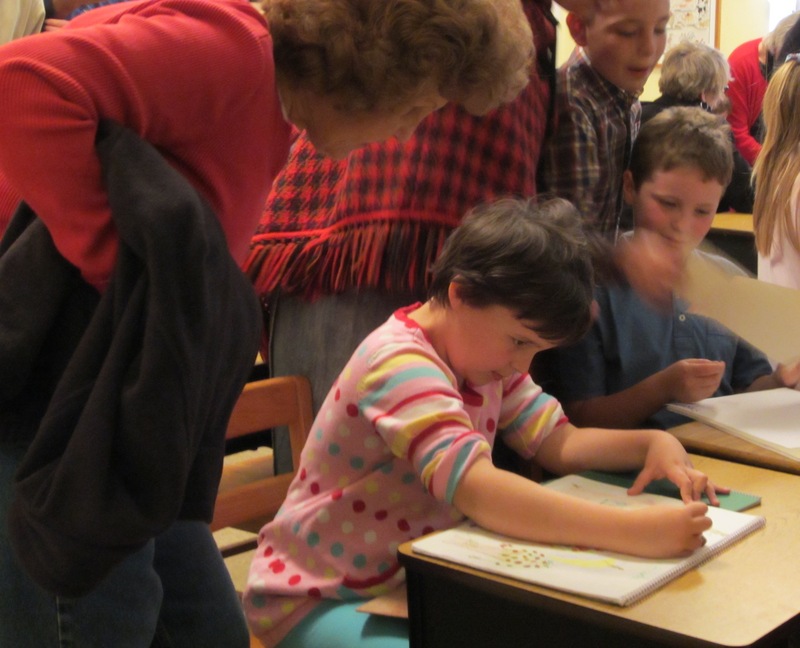 The final school event before Spring Break is the annual Grandparents and Loved Ones Day. Ivie proudly shows off her main lesson books to her Grandma. 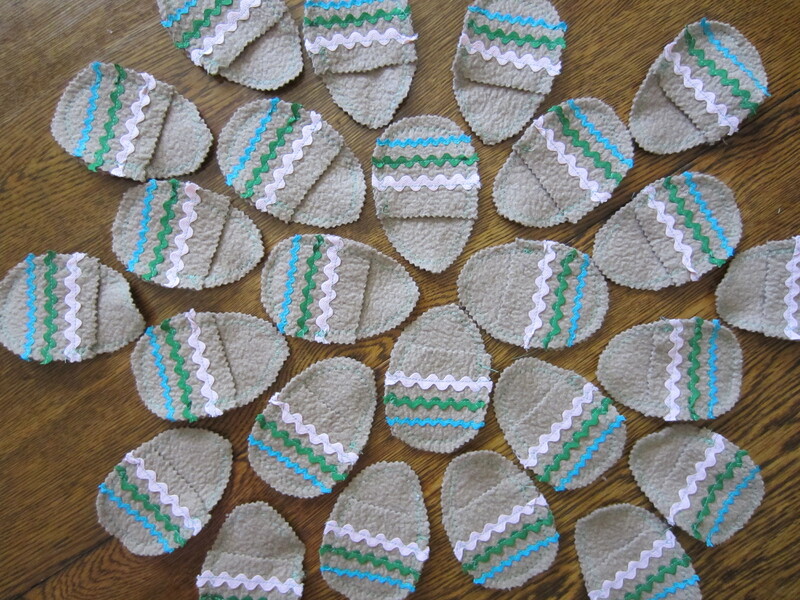 Spring also gave time for me to make my first and ninth bib for Craft Hope’s project 20: Hope for China. So now the Nature Table Spring flower fairies are enjoying a bright spring break bounty! 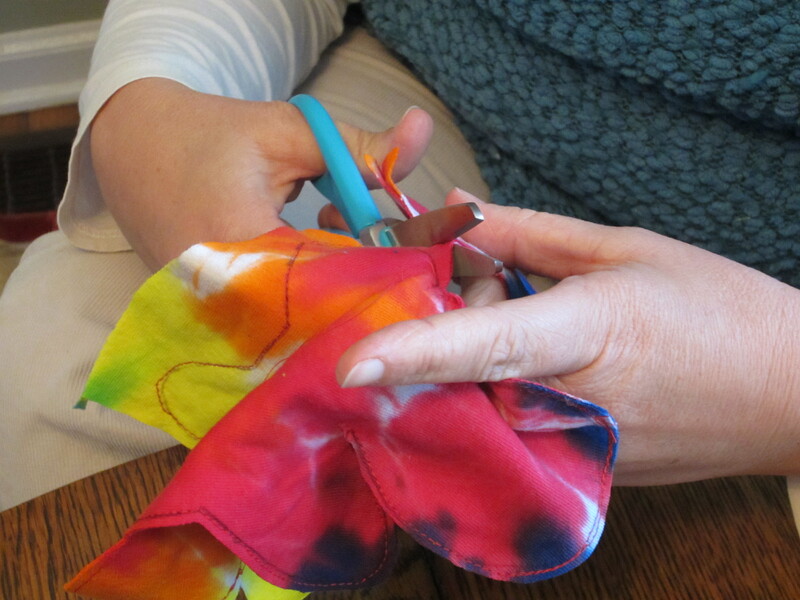 Click on over to Margaret’s blog, We Bloom Here to see her glove puppet tutorial today. 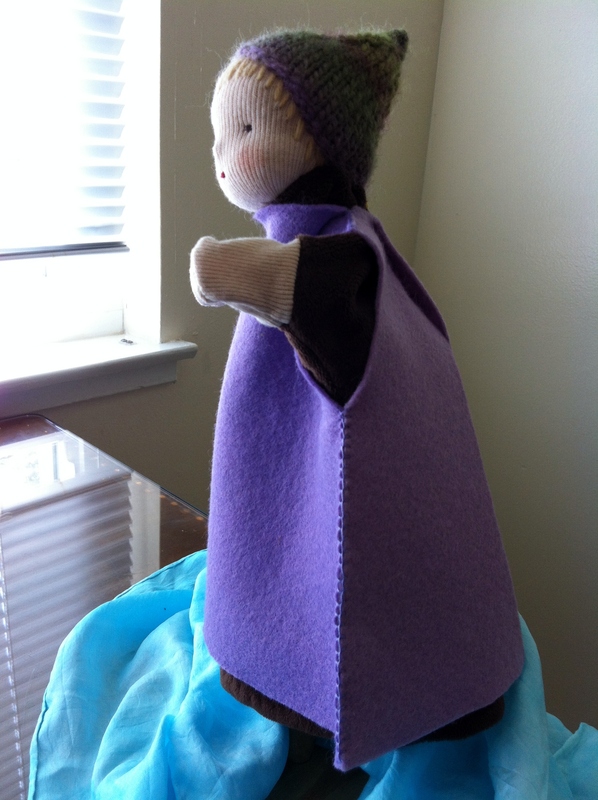 I will have a marionette tutorial up on Thursday, July 12. 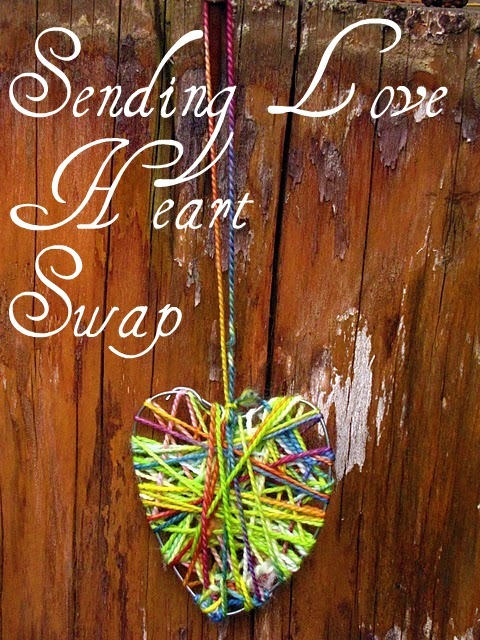 You still have 2 weeks till the swap sign-up period closes on July 24 to fall in love with puppet making and join us in this swap! 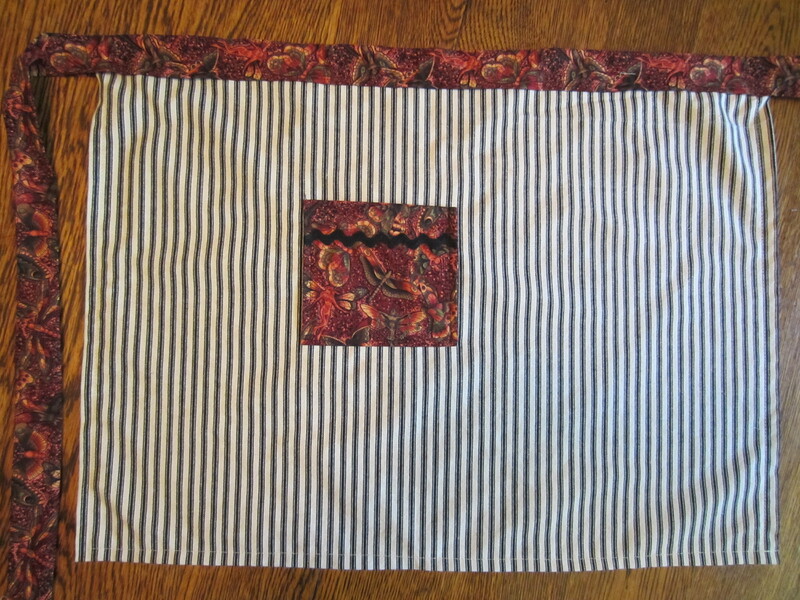 Five aprons were delivered to the Craft Hope project partner – Haiti by Hand today. 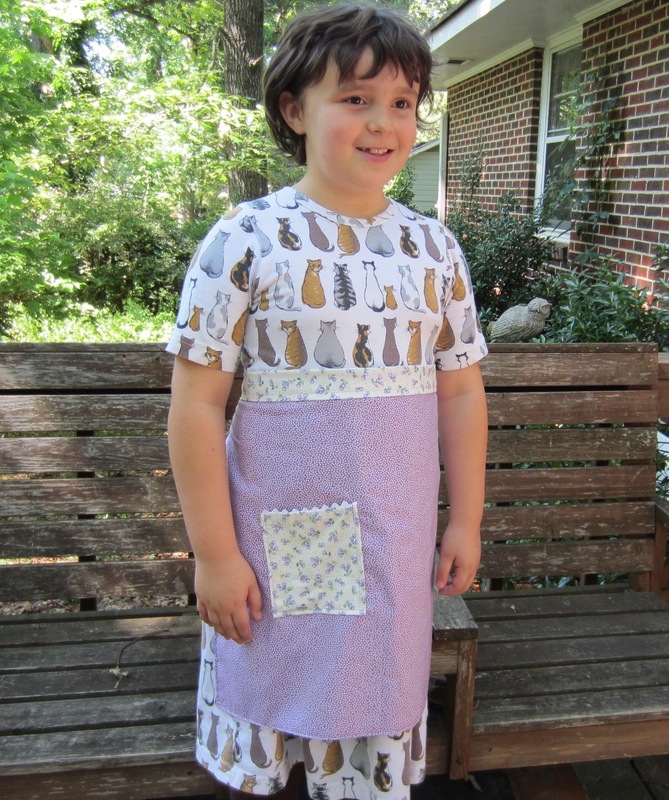 I made 6, but my model got to keep my first ‘learning’ apron. 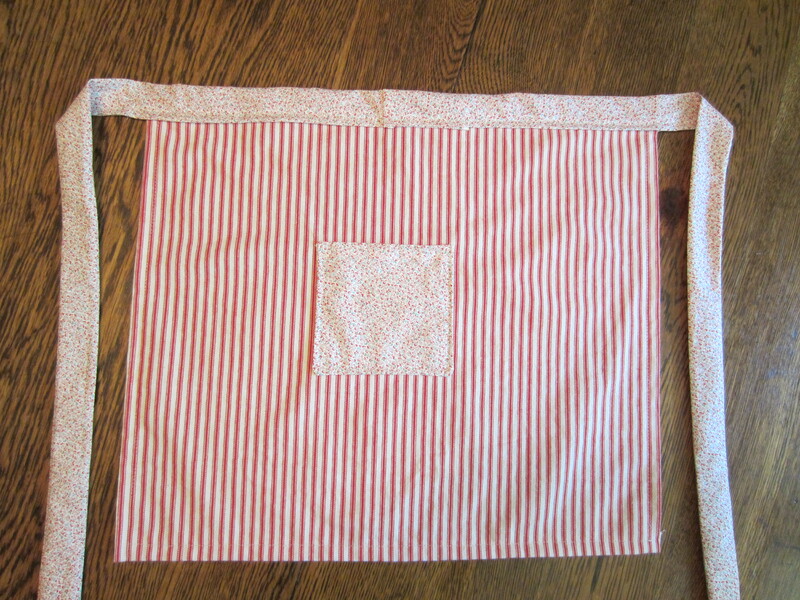 I have not made an apron since my 8th grade home-ec class. Aside from the somewhat short sash on the apron Ivie is keeping, they all turned out ok.
I’ve had this red ticking for a while. I just recently got the black ticking. It looks great with this cool fairy/butterfly fabric. 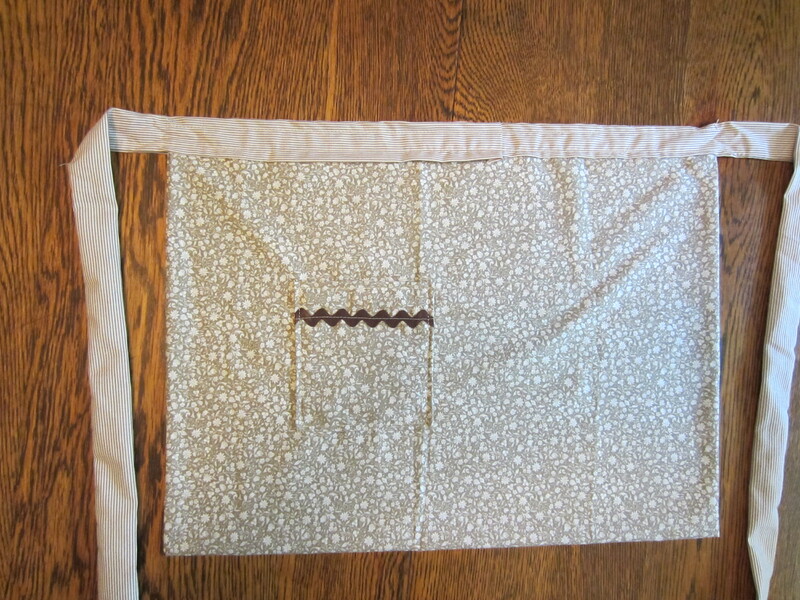 I made 2 aprons with the black. The brown stripe fabric used on the sash has been around for a while. 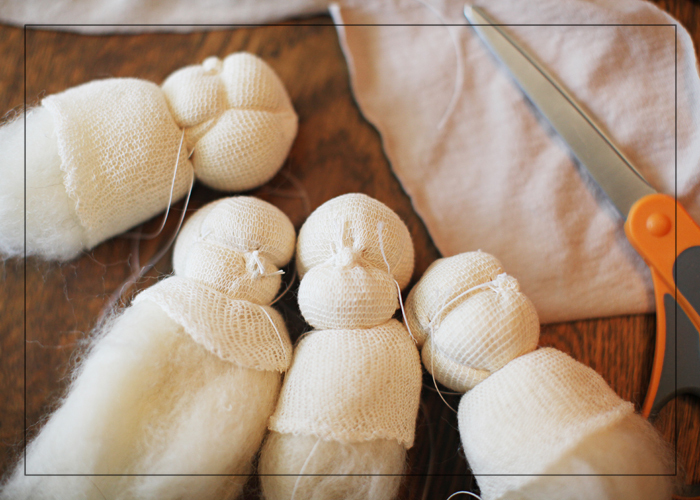 It is the fabric that ‘santa’s elves’ used to make Ivie’s baby doll sling a couple of years ago. 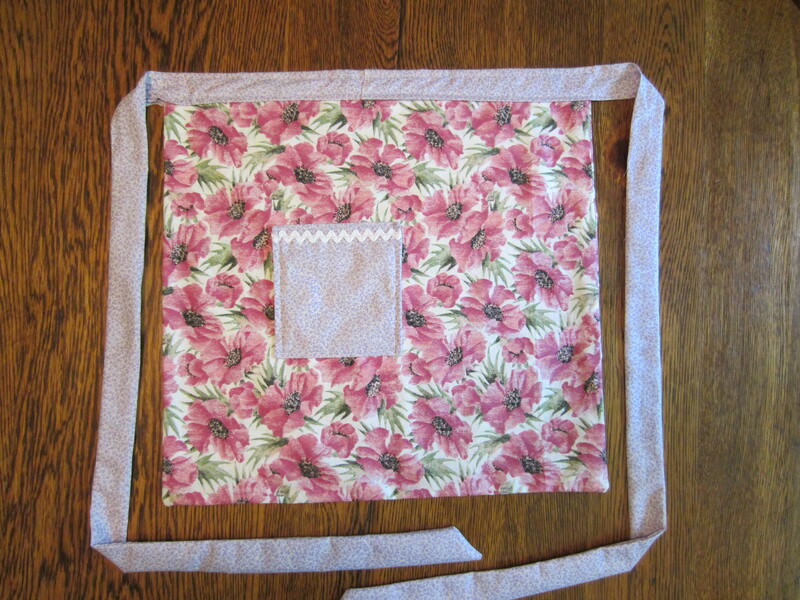 I bought the purple flower fabric, but the dainty purple print came from Lylia. She would be thrilled that some of her fabric was used for this project. The software that came with my new camera has a ‘photo stitch’ feature. What a neat way to show all 5 aprons.